All Seeing Eye Tattoo Lounge has grown once again!! 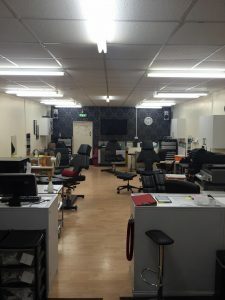 We have taken on the very well established Tattoo House that has been a firm fixture in Dewsbury for around 25 years under the ownership of David Banfield, a very well respected and multi-award winning tattoo artist. All Seeing Eye has taken on the modern studio along with artists and piercers H and Maria. This is a substantial move for our tattoo studio now growing it into a unbeatable studio with 5 resident tattoo artists, 2 piercers and full laser removal facilities. We are expecting the studio to become very busy as we merge our previous Heckmondwike customers with the Tattoo House existing clients along with new customer. It’s very exciting times! We have a studio now with all the lastest equipment and products and artists that provide custom tattoo work, very experienced in house piercers and a huge selection of jewellery, and laser facilities for getting rid of those unwanted or old tattoos. We are easy enough to find positioned right next door to The Time Piece (Wetherspoons pub) and up the stairs. Feel free to pop in for a no obligation chat or enquiry on any of the services we provide. We look forward to seeing you all soon at the all new All Seeing Eye Tattoo Lounge. Upcoming Tattoo Conventions for 2016 that we're attending!